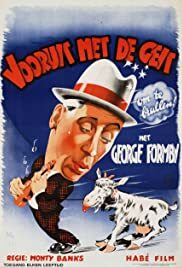 Daft ha'p'orth George Formby tries to claim a fortune left him by a rich aunt hidden in one of a set of chairs - but the chairs get sold at auction and split up, prompting a frantic runaround. Gus McNaughton is his sly accomplice whose cut rises from 10% to 100% during the course of the operation. Alistair Sim is also after the stash. George gets to twang "When I'm Cleaning Windows" and a couple of other saucy numbers. Most remarkable is the first appearance of Britain's answer to Shirley Temple, Binkie Stuart, who at 3 years old is singing, dancing and cracking jokes - a bit of an eye-opener. Quite worthwhile, and with a surprisingly satisfying ending.